The Gorton Center held its fourth annual Statesmanship series luncheon in conjunction with the William D. Ruckelshaus Center on Monday, November 21, 2016, in downtown Seattle. This year’s topic, Statespersonship in D.C.: Prospects for Collaboration in 2017, was moderated by TVW President Renee Radcliff Sinclair and featured U.S. Representatives Suzan DelBene (D-1st), Derek Kilmer (D-6th), and Dan Newhouse (R-4th) as they discussed prospects for working together in this evolving and challenging political era. The sold-out event was sponsored by K&L Gates law firm, the Henry M. Jackson Foundation, Van Ness Feldman law firm, Starbucks, Microsoft, JP Morgan Chase and Premera, and was filmed and archived by TVW. For those who missed the event, it is available on the TVW website. 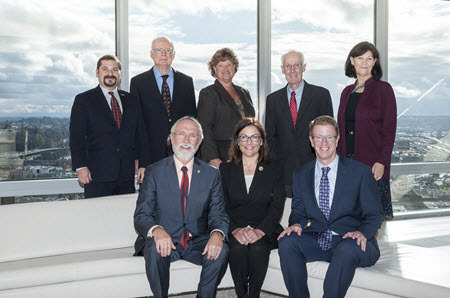 Michael Kern, Bill Ruckelshaus, Renee Radcliff Sinclair, Slade Gorton, Mariana Parks, with the panelists Rep. Newhouse, Rep. Delbene, and Rep. Kilmer at the annual Gorton Center and Ruckelshaus Luncheon. 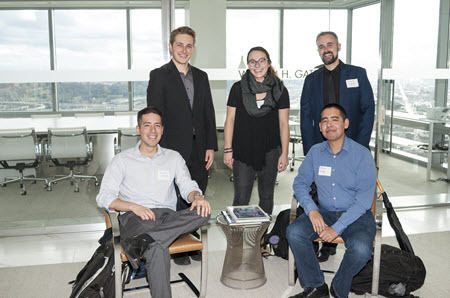 Gorton Global Leaders Program students Cesar Garcia, Grant Beckett, Anne-Celine Jeffory-Meynard, Johnny Merolla, and Marciano Quinonez attend the annual Gorton Center and Ruckelshaus Luncheon.